(長光門). 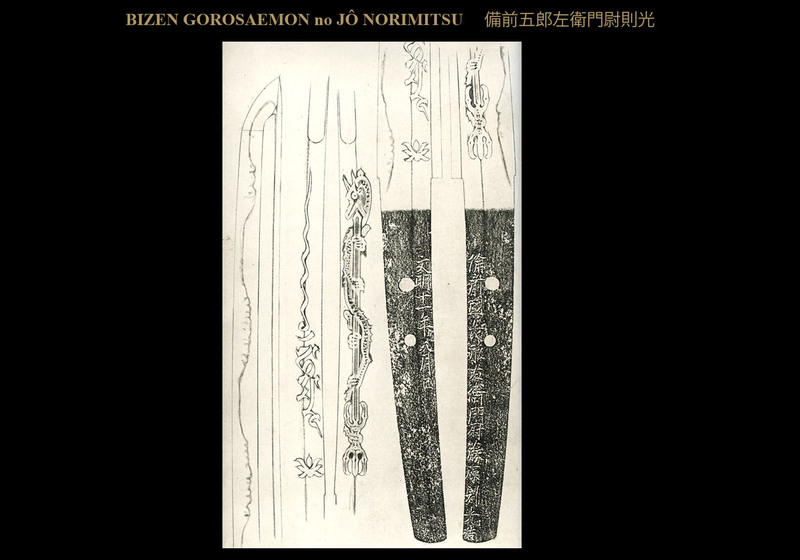 It is interesting to note that Gorozaemon-no- Jô Norimitsu (五郎左衛門尉則光) is also known as the first generation of the line of Norimitsu (則光) smiths who worked from the Eikyo Era forward. Of these smiths, Gorozaemon-no- Jô (五郎左衛門尉) is commonly referred to as the most able of the Eikyo smiths and there are some excellent works remaining that were made by him. He was known to have made many special-order blades. 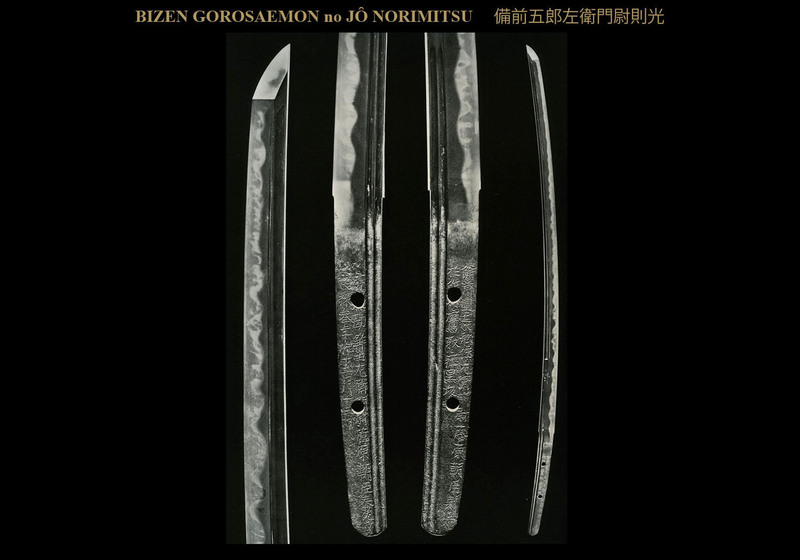 We know that Gorozaemon-no- Jô Norimitsu（五郎左衛門尉則光） had a long life and produced many fine blades. We have signed examples of his work well into the Bunmei era (1469-1487). In fact, the example used for this month’s kantei is dated Bunmei jyunen (1478). 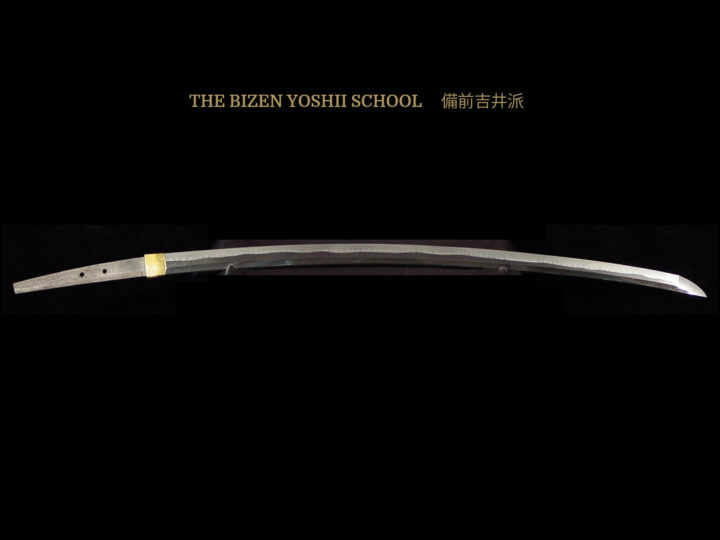 Since there is a signed example by Norimitsu (則光) dated Bunmei kyunen nanajyusai (made in 1477 when he was 72 years old), we know that he was about 73 years old when he made this month’s kantei blade. The Oei era saw the beginning of a transition from the oversized blades of the Nanbokucho era to the smaller, one-handed ko-dachi and sun-nobi tanto that were to become very popular at the beginning of the Muromachi era. Gorozaemon-no- Jô Norimitsu（五郎左衛門尉則光) left many examples spanning the periods from the latter days of Oei (1394-1428) to Bunmei (1469-1487). He is best known for making sunzumari katana (slightly shorter than normal) and musori sun-nobi tanto (slightly longer than usual). This sword could be considered an excellent example of the former. He is also known to have made gassaku (合作) blades while working together with his contemporary smiths as Bizen Katsumitsu（備前勝光）. SUGATA: His long swords have koshi-zori that was generally shallow and graceful. Those graceful swords tended to be short and have funbari at the machi tapering slightly toward the kissaki. He also made some long blades with the shape a little stronger. In either case, the kasane will be thick but there will be little hira-niku. The majority of his works are short katana, wakizashi and sun-nobi tanto. 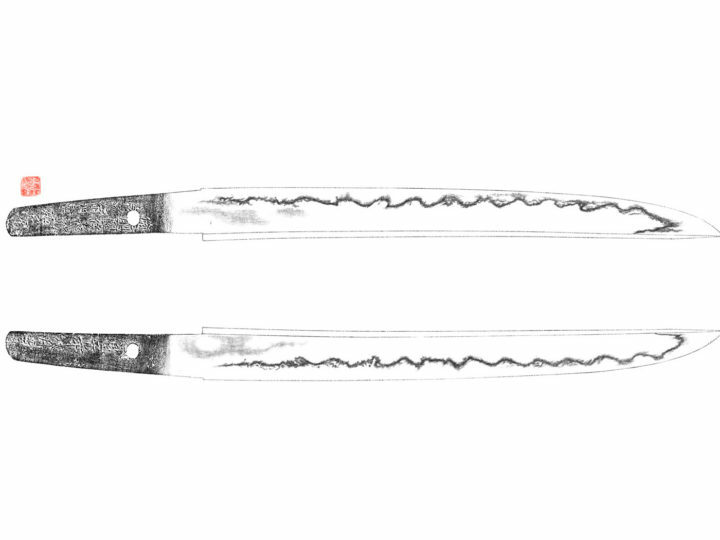 The tanto will be mu-zori and hira-zukuri. They will resemble the work of Yasumitsu. JITETSU: The grain will be a very fine itame hada mixed with mokume hada and there will be ji-utsuri. 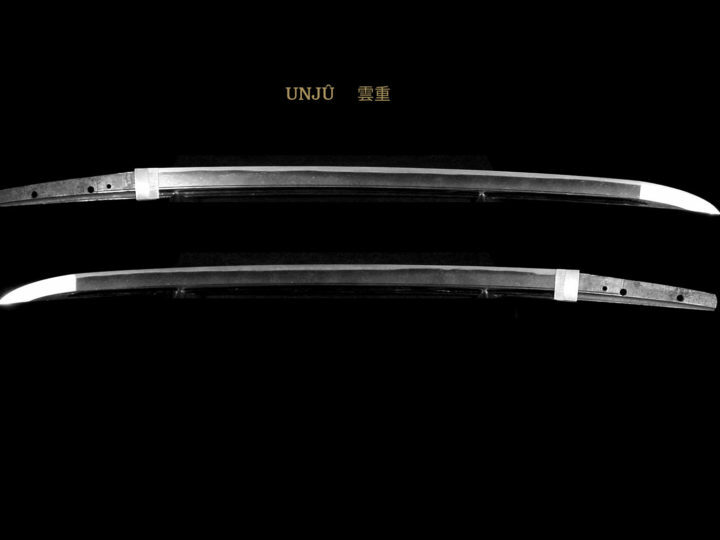 As is typical of swords made in this time period, the utsuri will occasionally bemidare-utsuri, but in most cases it will be the more typical bo-utsuri. HAMON: When the yakiba is midare, it will be wide and the pattern of the midare will be like wide valleys. When it is suguha, it will be narrower. In either case, there will be littleactivity within the hamon and the nioi-deki will be narrow (nioi-shimi). There will, however, be areas of nie within the hamon especially in the habuchi. BÔSHI: Generally made in midare-komi with little kaeri. NAKAGO: The nakago will be short and stubby. The tip will be a broad kurijiri and a little ha-agari. The file marks usually will be kiri or katte-sagari. HORIMONO: The blades whose shape is strong will have carvings such as bo-hi, bo-hi with soe-hi, bo-hi with tsure-hi, or futatsuji-hi. Those blades whose shape is more graceful will have similar carvings. The bottom of the carvings will be marudome or kakudome ending at the machi or kakinagashi into the nakago. 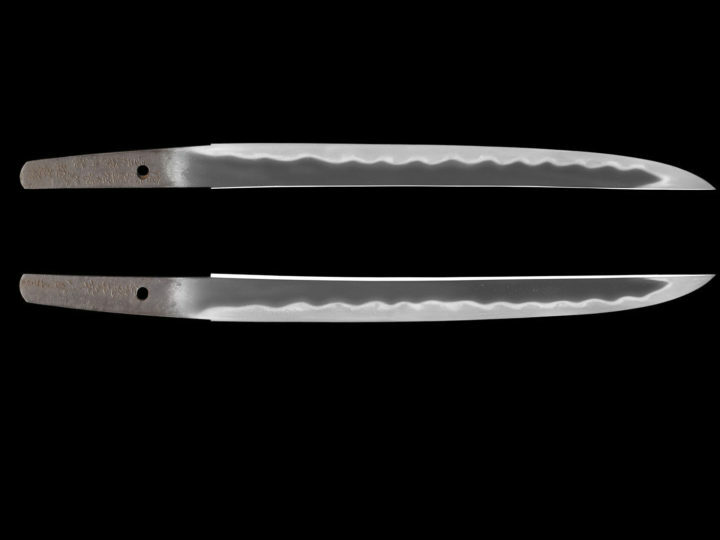 The designs will be the same in wakizashi and hira-zukuri ko-wakizashi (sun-nobi tanto). MEI: The mei will generally be long and the blades are often dated.